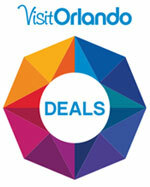 "The Official Source for Orlando Travel Planning" is www.visitorlando.com. Here, visitors to Central Florida's theme parks and attractions can take advantage of a plethora of discounts, including discounted theme park tickets. Discounts can be obtained by printing out an offer and presenting it at time of purchase. In addition, you may show the offer using a mobile device to receive the discount. There are too many discounts for us to list them all here, so visit the official site for all of Visit Orlando's amazing discount offers!